Tonight we have broken a record: this is the first year we have not had a single day in the 80’s in June. I am not impressed. 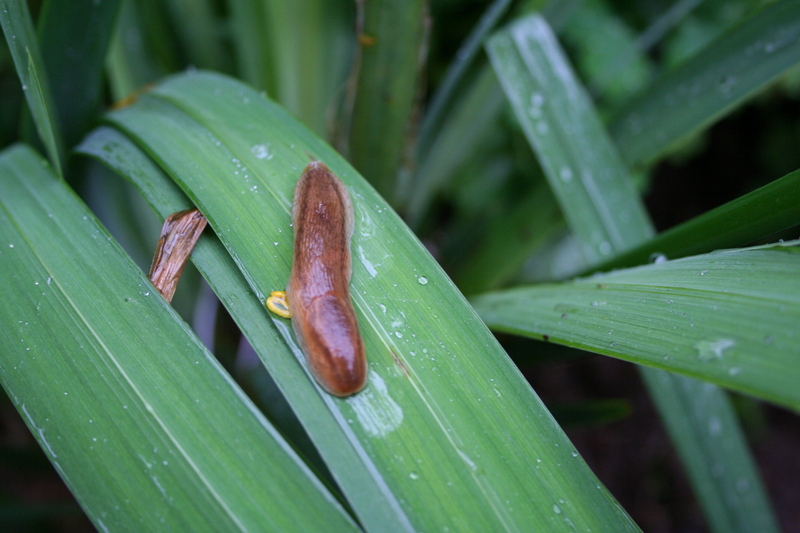 One thing about the rain: it has been a banner year for slugs. I don’t mean those people who move like molasses in the wintertime, either. I mean those voracious gastropods for which the Pacific Northwest is renowned. The first time I ever saw a slug was on vacation in Oregon in the 1970’s. It was huge. I now know slugs come in a range of sizes, species, colors, appetites, and slimes. I’ve read books on slugs, from Meg DesCamp’s Tossing Slugs to David Greenhorn’s Slugs, the latter of which made 3 year old Arwen cry when I read it out loud to her (probably the part about “put ’em in a blender and blend ’em!”). But mostly, I have lived with slugs. 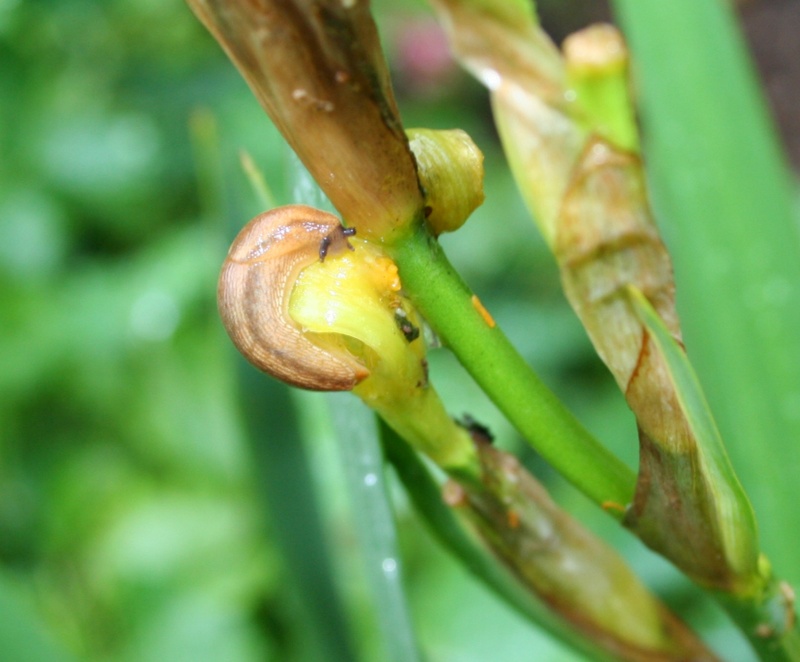 Slugs ravish my irises. I’ve tried beer traps (messy, messy, messy and the beer quickly becomes clogged with dead slugs, diluted with rainwater, and breeds mosquito larva): they only work where you have a minor problem with slugs, not a Pacific Northwest yard invasion. Salting them is a waste of salt. there isn’t enough salt in the world to kill all the slugs in 100 square feet of Pacific Northwest garden. Likewise, slug bait is expensive, has to be constantly renewed, you have to deal with the dead slugs, and you constantly worry about birds and small animals that may ingest it. Garden experts from other parts of the world advise that you do not leave out anything slugs could hide under: boards, buckets, and so on. 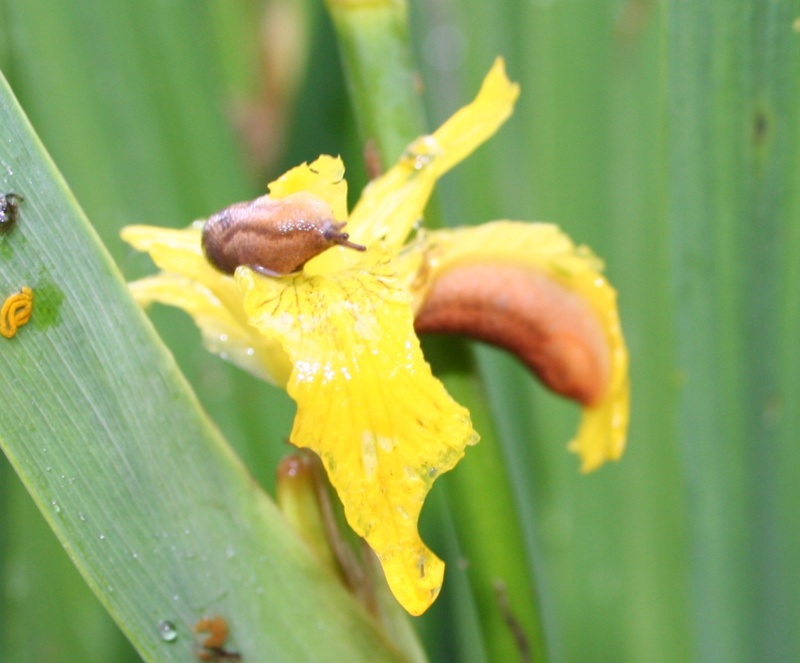 They fail to mention that slugs will hide under the leaves of your favorite irises, under the asters, the garbage cans, the eaves, the fallen leaves off of the neighbor’s oak tree that lie in your yard, on the dog poop, and up the sides of your house. 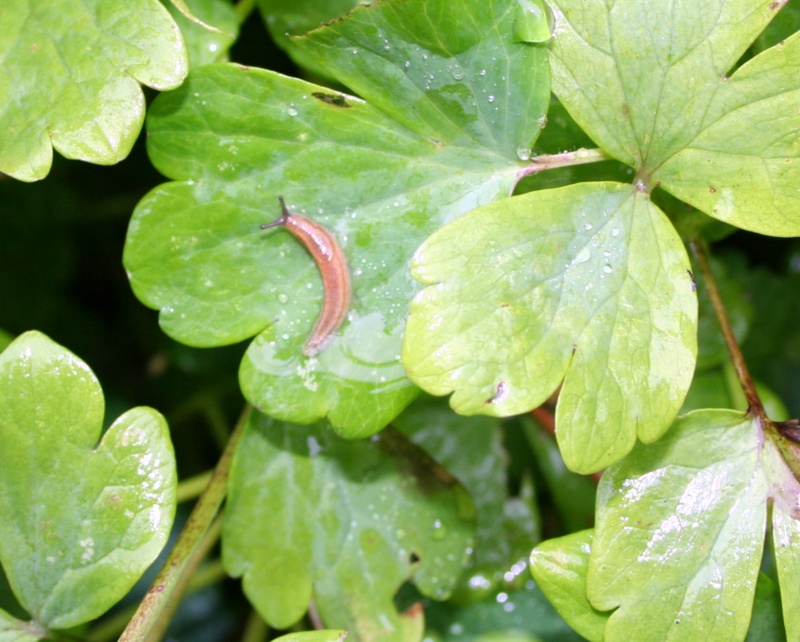 Pacific Northwest slugs are brazen slugs. Aside from picking the damn things off of my plants, one slug at a slimy slug time, I’ve found that the only truly consistent deterrent is copper. Unfortunately, it is expensive and difficult to find. Oh, you can buy that cheap “copper tape” that has a sticky side, but what do you stick it to? The dirt? I’ve tried copper mesh & copper barriers, but dang – I can’t purchase enough copper to wrap ever tasty plant in my garden. The copper mesh disintegrates after three or four years. The copper barriers work the best – if only I could afford the stuff. Have I mentioned how expensive copper is? But it works. The slug slimes up to the copper, touches it with a slimy antennae, and ZAP! They don’t like that little electric fence shock and slither away to damage something unprotected (or to find a nice dandelion leaf over hanging the copper barrier from which they can jump over the electric fence). Slugs. They damage a lot of my plants, but the irises are the ones that truly suffer their aggression. 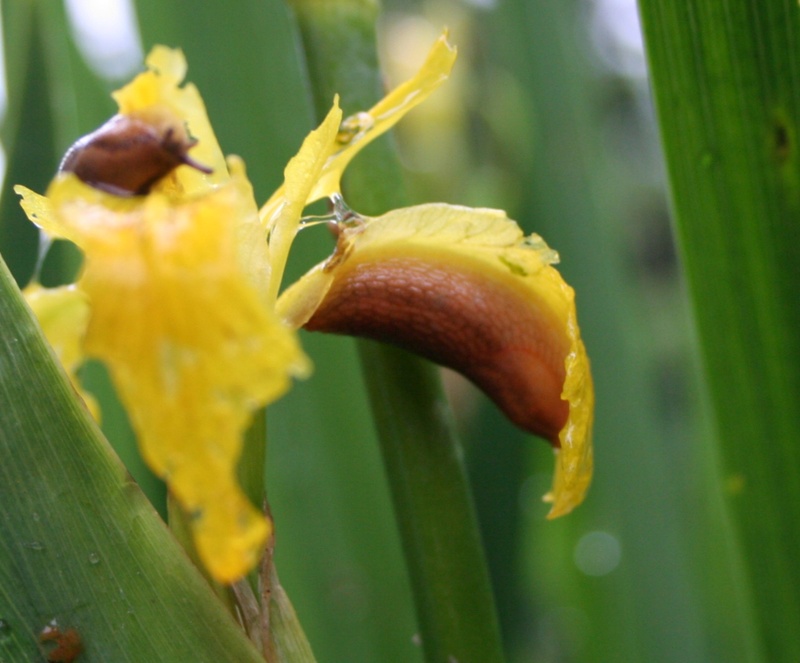 And there is nothing slow or sluggish about a ravenous gastropod on a tasty iris bloom. As you can see. In the end, I usually resort to the same technique Meg DesCamp resorted to in her book: I toss them as far as I can, preferably out onto the pavement where a car can run over them. Unfortunately, not enough cars drive by. Start saving pennies and put up a penny fence around your entire property!